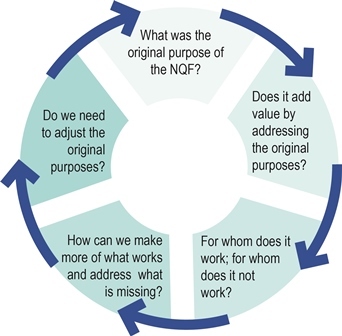 While every NQF is unique, being organically woven into the fabric of a country’s education and training system, the frameworks share many features. They are based on learning outcomes, support consistency of qualifications, and bring together stakeholders from across the board. Thanks to the dynamic progress of NQF development, several national frameworks now provide comprehensive ‘maps’ of national qualifications and the relationships between them. This increased transparency across systems and borders has helped promote mainstreaming and comparability of qualifications at European level. In recent times, discussions have increasingly focused on the frameworks’ usefulness to employers, jobseekers and, more generally, citizens. In some countries, the frameworks’ level indicators are used to support employers in staff selection, recruitment and development, e.g. by informing job vacancies. In other countries, these indicators have helped integrate private sector qualifications into national qualifications systems or have supported the validation of non-formal and informal learning. Check out Cedefop’s new briefing note on qualifications frameworks’ changing role for an overview of progress achieved and of remaining challenges.